This is my first draft, so to speak, of an embroidery based on Dr Adam Hamlin's image of neurogenesis in the dentate gyrus of a mouse brain. I started stitching in lime green silk thread on a black silk background, creating patterns of stitches that explore some of the texture that's visible in the image. The shape of this area of the brain gives rise to its name: it looks like a particularly sharp and nasty tooth, hence "dentate". But the shape also reminds me of something else... a mouse's tail. Remember The Mouse's Tale in Alice in Wonderland? As a child I loved the way the words of Lewis Carroll's silly poem trailed down the page in the shape of a tail, making the pun obvious (and making a nightmare for the typesetter in those days, I dare say). 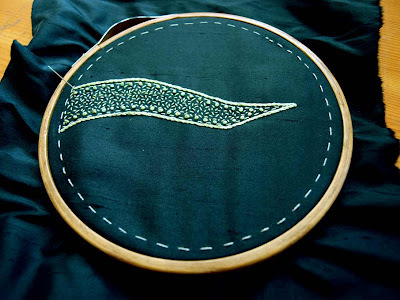 It makes my embroidery a kind of synechdoche (pronounced sin-neck-da-key): in exploring the shape and texture of a part of the mouse's brain I am exploring the whole mouse, and every mouse.